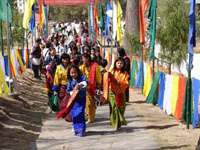 The following is the sequence of dances at Paro Tshechu. Most dances are the same at others Tshechus, but the sequence varies. This dance is also referred to as the Gar dance, derived from the different traditions of the tantras (texts of Northern Buddhism). The Black Hat Dancers first build a mandala and then shred demons into pieces. In this way they take possession of the earth so that they can protect it. To empress their power on it, they dance the step of the thunderbolt. To draw the mandala, they use a practice taken from a text called Lamey Gyu or the Tantras without Superior . These practices are considered so special that they very act of seeing them purifies and clears the mass of mental obscurity accumulated over ages (kalpa). The inner and outer obstacles are thus pacified. Given its importance the Shabdrung himself performed this ritual. Tsangpa Jarey jumped on the frog, performed a dance and said: if anybody wants to compare himself to me, the son of the glorious Drukpa lineage, let him come . Costume : knee length skirts, animal masks for the dance with the sticks, terrifying masks for the dance with swords and drums. This dance is re-enactment of the great saint Milarepa s (1040-1123) encounter with a hunter. Milarepa was in deep meditation at a hermitage called Nyishangkurta, on border between Nepal and Tibet, when he heard a man shouting and a dog barking. Going out to investigate he came upon a profusely panting and sweating red haired stag. The stag was trembling in fear. Overcome with great compassion, Milarepa sang a religious song which soothed the stag and made it forget fear. The stag laid itself on the right of the sage. According to King Norzang s biography, the son of a hunter in his kingdom was once granted a wish for saving the life fore of a serpent deity. He borrowed the magic noose which could capture anything and ensnared Yidrogma, the most beautiful woman around. He offered Yidrogma as a gift to King Norzang. King Norzang already have five hundred Queens but became so besotted with Queen Yidrogma that he began to neglect the other queens. The queens, unable to bear the king s indifference, sought the services of Hari, through black magic, caused King Norzang s father to see a prophetic dream. Shinje Chghogyel, Lord of Death, estimates the value of good and bad deeds during the judgement . Also present are the White God and Black demons who live with every being from birth, and all the Shinje s helpers (Rakshas) who emanate under numerous forms. These are: the ox-headed justice minister; the wild hog-headed helper who maintains account of the black and white deeds; the khyung-headed bird (the khyung is a mythical bird) who holds a small sword which cuts the root of the three poisonous-ignorance, envy, anger-and a big hammer which demolishes the rocky mountains of the sins; the lion-headed helper who holds a lasso which represents love and an iron chain representing compassion; the fierce bear-headed helper who holds the magical noose which ties the means and wisdom together and a saw which cuts selfishness; the serpent-headed helper whose mirror reflects all actions; the monkey headed helper who weighs them on a scale. The Rakshas separate with equanimity the black from the white actions of all beings, just as in the case of the sinner Nyelwabum and the virtuous Chimdapelkye. The frightening court of justice cannot be avoided by condemned beings, but after enduring certain sufferings, their sins are washed away. Progressively, they are led to the pure fields and paradise. Unfortunately, some beings do not understand that everything is the result of their mind, whether it is pure or impure. The dance shows that if they devote themselves to virtuous actions, the will be immediately to paradise. Regarding the different forms of Shinje s helpers, those beings who are born into the human world where the doctrine of Buddha has been propagated, recognize them as incarnations of Buddha. They are thus delivered from the frightening Bardo the paradises. The origin of this dance is to be found not only in Sutras and Tantras, but also in the books discovered by Karma Linga. The dance can be described as more of a play than a dance and lasts approximately two hours. Firstly, there is the long dance of all the Rakshas during the judgement. Then Shinje himself appears, symbolized by a huge puppet which holds a mirror. The White God and the Black Demon enter the courtyard with him. Then the judgement begins. First the Black Demon and the main helpers perform a dance. Then the sinner who is dressed in black and wearing a hat arrives. He is very frightened and tries to escape but is recaptured each time by the helpers. From his basket, a freshly severed cow s head is taken, implying that the sinner was responsible for killing it. The judge then weighs his actions. Afterwards the White God sings of the merits of the man, followed by the Black Demon who expounds the sins of the man. Finally a black strip of cloth symbolizing the road to hell, is spread and the sinner sentenced there. The dance depicts the paradise of Ugyen Rimpoche from where all the incarnations of Ugyen Rimpoche, essence of all the Budhas, are sent to the Three Worlds. In the middle of a great palace is seated Ugyen Rimpoche. On his right the holy men are Tibet and India are seated in a row and on his left the learned men (Pandits) from Tibet and India. In all the intermediate zones are the 108 Treasure Discoverers (terton) who are his incarnations, and also his twenty five disciples, including the king of Tibet Trisongdetsen. The dance brings total happiness for the people who believe in the manifestations of Ugyen Rimpoche. It is a celebration of the changeless faith in the glorious deeds of Ugyen Rimpoche s mind, speech and body.